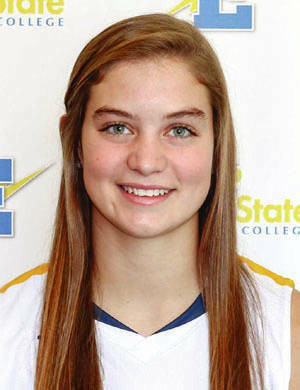 Edison State sophomore Clair Schmitmeyer has been named the OCCAC D-II women’s basketball co-Player of the Week for Jan. 28-Feb. 3. Schmitmeyer did a little bit of everything in a busy week for the Chargers, posting per game averages of 12.3 points, 7.3 rebounds, 5.0 steals and 4.3 assists in a total of 98 minutes spanning three contests. Schmitmeyer is now the owner of four OCCAC weekly awards in her career, three coming from this season. Schmitmeyer is averaging 12.8 points, 8.9 rebounds, 3.5 assists, and 3.3 steals per game in her second season at Edison State (17-4, 6-3 OCCAC). The Edison State men’ and women’s basketball teams both improved to 18-4 overall and 7-3 in the OCCAC with wins over Hancock Community College Wednesday night. The Edison State men jumped out to a 61-40 halftime lead and won 112-69. Lacey Watson had 24 points and six rebounds for the Chargers. Lamine Komara added 17 points and Roman Morgan scored 13 points. Sean Jones netted 11 points, Jaedyn Carter scored 10 points and Malot Dushaj had 10 points and three assists. Azende Johnson scored 33 points and had eight rebounds for Hocking. Jarell Giles added nine points. ESCC was 42 of 64 from the floor for 66 percent, including nine of 18 from 3-point range for 50 percent. The Chargers made 19 of 28 free throws for 68 percent. Hocking was 23 of 62 from the. floor for 37 percent, eight of 24 from 3-point range for 33 percent and 15 of 20 from the line 75 percent. Edison won the battle of the boards 33-19 and had four turnovers to Hocking’s 10. The Edison State women cruised to an 88-26 win over Hocking. The Chargers led 22-8, 44-17 and 68-22 at the quarter breaks. Clair Schmitmeyer had 20 points, nine rebounds, seven assists and five steals. Rebekah New added 20 points and eight rebounds, while Sarah Pothast had 13 points. Lauryn Gray had 10 points had nine rebounds, while Kayla Tullis had nine points, nine rebounds and five assists. Brogan McIver added eight points and six steals. Abigail Blosser pulled down eight rebounds, Meredith Cameron grabbed six rebounds and Shannon Moore pulled down five. ESCC was 40 of 89 from the fkoor for 45 percent, including two of 10 from 3-point range for 20 percent, The Chargers made six of 12 free throws for 50 percent. Hocking was nine of 48 from the floor 19 percent, three of 22 from long range for 14 percent and five of eight from the line 63 percent. Edison State won the batlle of the boards 57-23 and had 10 turnovers to Hocking’s 25.